Reviewing Ellis Island facts is an intriguing way to discover the history of the island, the immigration station and the factors which eventually caused the immigration station to close. The facts also provide a backdrop for genealogists to understand the inspection process of immigrants arriving in the United States from 1892 to 1954. Over twelve million immigrants entered the United States through Ellis Island between 1892 and 1954. In 1907 the United States reached the pinnacle of immigration with approximately 1.25 million immigrants passing through Ellis Island. Ellis Island was frequently called the "Island of Tears" by immigrants even though only two percent of the immigrants who were processed through Ellis Island were denied entry into the United States. The two main reasons for entry denial were the diagnosis of a contagious disease or the fear that the immigrant could not support themselves or might be an illegal laborer. As of 2009, the Ellis Island Immigration Museum receives almost 2 million visitors a year. Ellis Island was originally known as "Gull Island" by the local Indians. The Dutch and English colonists called the island "Oyster Island" due to its abundant oyster beds. Samuel Ellis purchased the island in the 1770s. In 1808 the Federal government purchased Ellis Island from New York State and created Fort Gibson. Ellis Island was originally a 3.3 acre island which was enlarged to 27.5 acres by landfill from ship ballast and dirt from the construction of the New York City subway in the early 1900s. In 1998 New York lost a 160-year dispute with New Jersey over rights to Ellis Island. The Supreme Court ruled that New York could keep the original 3.3 acre island; but, the remaining 24.2 acres of landfill belong to New Jersey. From 1855 to the 1890 opening of Ellis Island, immigrants were reviewed on Castle Island at the tip of Manhattan Island, the first official immigration center. President Benjamin Harrison designated Ellis Island as the first United States immigration station in 1890. The first immigrant to be processed at Ellis Island was Annie Moore, a 15 year-old Irish girl who, accompanied by her two brothers, entered the United States on January 2 1892. On June 14, 1897, the immigration station on Ellis Island burned to the ground along with the Federal and State immigration records from 1855 through 1897. The new Main Building on Ellis Island was opened on December 17, 1900 and 2,251 immigrants were received that day. The other buildings on Ellis Island (hospital and disease wards, dormitories and kitchens) were built between 1900 and 1915. In 1918 and 1919 Ellis Island was used to detain thousands of suspected enemy aliens during World War I. During this time immigrants were inspected on their arriving ship or at the docks. The immigration receiving station was reopened in 1920 and over 225,000 immigrants were processed in that year. After World War I, United States embassies were established throughout the world, providing a place for immigrants to apply for a visa and to have a medical inspection. After 1924 the only immigrants detained at Ellis Island were individuals with paperwork problems, refugees and displaced persons. During World War II enemy merchant seamen were detained at Ellis Island. About 60,000 United States Coast Guard servicemen were trained on Ellis Island, one of many military uses of Ellis Island. Ellis Island was closed in November 1954. The last detainee at Ellis Island was Arne Peterssen, a Norwegian merchant seaman. President Lyndon Johnson declared Ellis Island part of the Statue of Liberty National Monument in 1965. Between 1976 and 1984 Ellis Island was reopened to the public. A major restoration of Ellis Island started in 1984. The $160 million project was funded by donations made to the Statue of Liberty-Ellis Island Foundation. This was the largest United States historic restoration project. 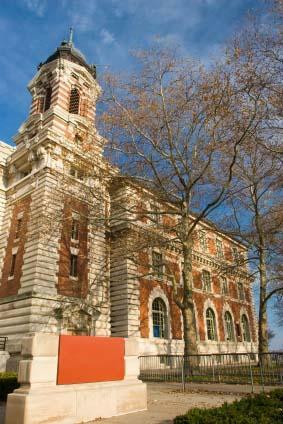 The main building at Ellis Island was restored and reopened as the Ellis Island Immigration Museum on September 10, 1990 with Ellis Island facts and exhibits that included Ellis Island pictures, artifacts and history. Each immigrant was required to answer twenty-nine questions which would be used as the basis of the health and legal inspections. First and second class passengers were only inspected at Ellis Island if they were sick or had legal problems. Otherwise, they were interviewed and inspected on their incoming ship, passed through Customs at the piers and allowed to enter the United States. Third class or "steerage" passengers were transferred from their ships by barge or ferry to Ellis Island where they would undergo a medical and legal inspection. The Ellis Island inspection process would last approximately three to five hours in the Great Hall after which the immigrant would return to the dock by ferry or be sent to the Ellis Island hospital or disease wards. The United States Public Health Service and the Bureau of Immigration (renamed the Immigration and Naturalization Service - INS) were the two agencies responsible for processing immigrants at Ellis Island. The Statue of Liberty-Ellis Island Foundation maintains a database of immigrants who passed through Ellis Island, with the exception of records which were destroyed in the 1897 fire. The Ellis Island immigration records can be reviewed online.